1. Prepare the ice cream and the cookies according to their instructions. 2. Remove the prepared ice cream from the freezer and let sit out at room temperature for 10 to 20 minutes to soften to a workable consistency. Have the baked oat-graham cracker cookies handy and ready to use. Place an airtight container (open) in the freezer – this way you can place the assembled sandwiches in the freezer as you go. 3. Lay 1 cookie square flat on the counter or a cutting board. Carefully spread a scoop or two of ice cream on top of the cookie. 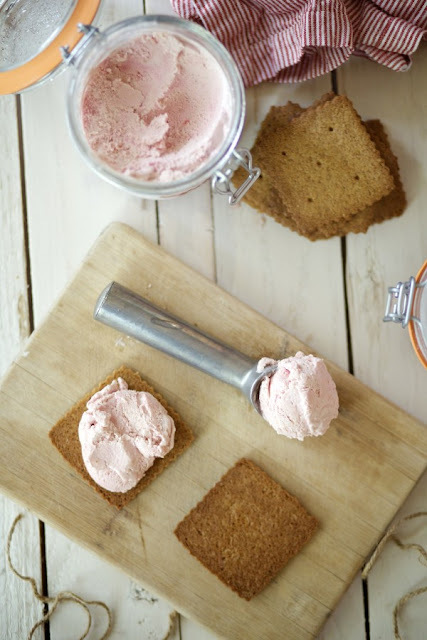 Shape the soft ice cream into a square to match the shape of the cookie – you can use a broad ice cream scoop or an icing spatula to do this. 4. Carefully press a second cookie on top of the ice cream. Take care not to break the cookie or to squish excess ice cream out the sides of the cookies. 5. 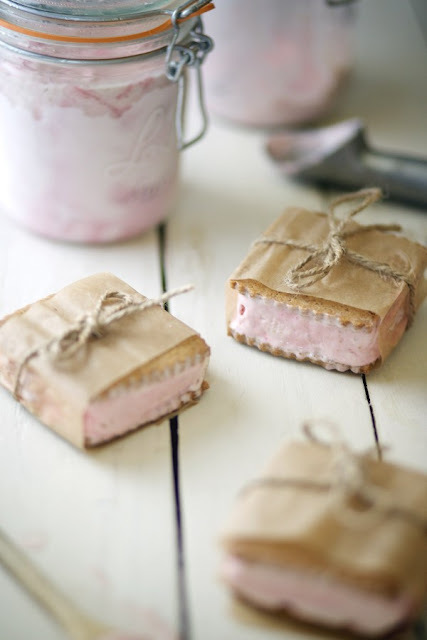 Wrap the assembled ice cream sandwich in a parchment paper slip. Tie the paper in place with twine or string. Place the wrapped ice cream sandwich into the container already in the freezer – doing this as you go will keep any ice cream sandwiches from melting. 6. Repeat steps 2 through 4 until you assemble all the ice cream sandwiches. Feel free to mix and match your favorite cookie or ice cream flavors. Pay attention to the temperature while assembling this recipe. Found this lovely cooking/baking blog - Chasing Delicious. Beautifully written and fill with wonderful recipes. 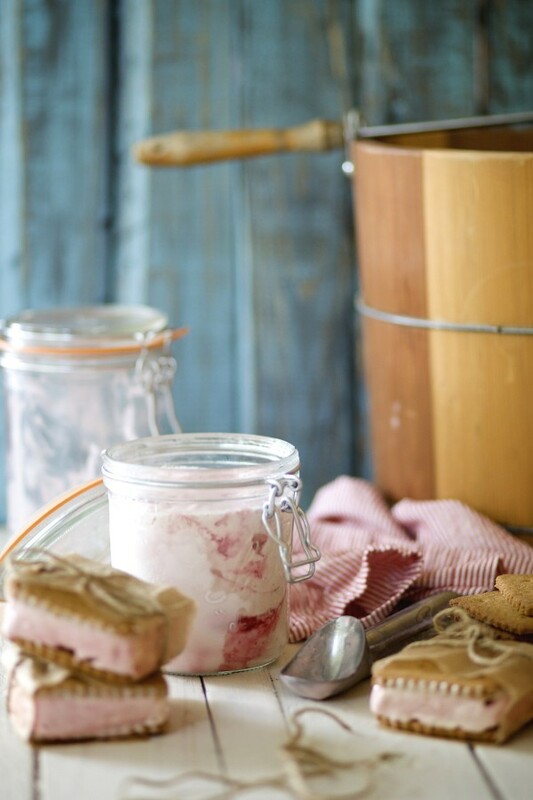 This simple ice-cream cracker sandwich recipe is just too beautiful not to be shared (more details head over to his blog). Great for small parties and gatherings. I have to admit I haven't taken much interest in cooking until quite recently. My parents are wonderful cooks. And my sis likes to think she's one too (I can't really vouch for that). Me? I rather have takeaways or instant, microwavable food; mainly because I can't be bothered. However I have grown particularly interested in food recently especially with the continuing popularity of MasterChef here in Aus. In the past few months, I have been collecting recipes and browsing food blogs for ideas. I think I have a nice stack of recipes now, so I should finally act on it and start making/cooking something, anything (edible). Ok, maybe not this week. Hopefully before I go on holidays. Before I go on hiatus for the weekend, I would like to wish all fathers a very Happy Father's Day. Have a great weekend girls and guys alike! Take it easy. Wow, I really love the pictures here. So elegant and tasty. I especially like how they're wrapped up in paper. Looks absoultely amazing. I'd love one please! Thanks. I had a great wkend. They will most likely melt in my hands before I manage to wrap them up this nicely. So do I! I'm planning to try and make them ... soon. Snapshots and snippets of little things I adore. On life, travels, food, music, events, art, fashion, design ... anything and everything. Sometimes quiescent... and yet sometimes restless. 20 most beautiful bookstores in the world?